Hey there, everyone! Welcome to the March Lawn Fawn inspiration week!! 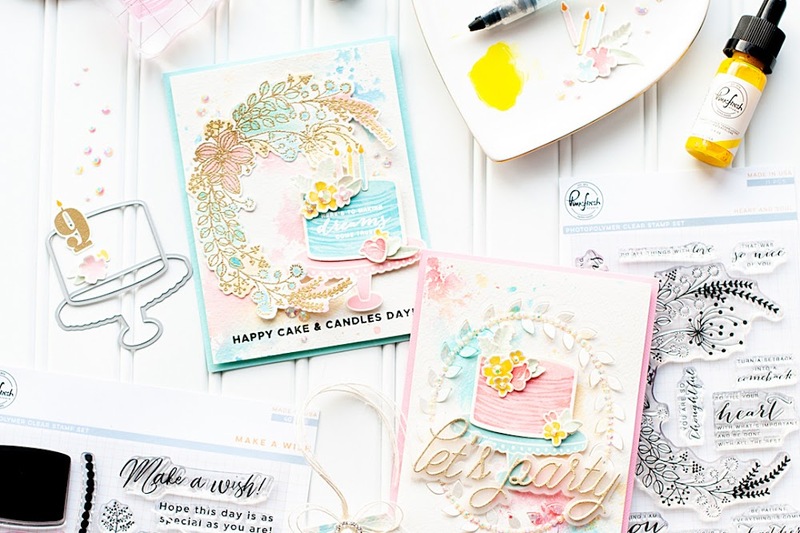 We have a fun week in store for you, showcasing projects using some of the newly released stamps and the "Bright Side" paper line. You should see all of the new items in your favorite store that carries Lawn Fawn, and of course, you can purchase what you like from the Lawn Fawn website as well! 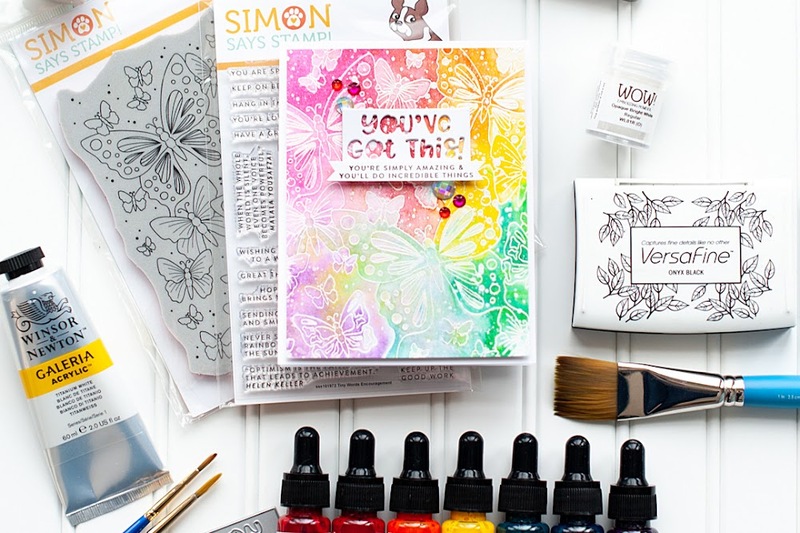 Tonight we are sharing projects using "Critters Ever After", the latest in the Critters series by Lawn Fawn. The critters are such a popular stamp collection, and it seemed fitting to carry a stamp set of magical critters, don't you think? This stamp set, particularly the unicorn, makes me think back on my days in elementary school when I was obsessed with Lisa Frank. I had stickers upon stickers upon stickers, not to mention school folders & notebooks, stationary...who knows what else! My favorite folder ever had a purple and pink unicorn on it, which you will see I used on my card as well! Such great memories of being a kid! 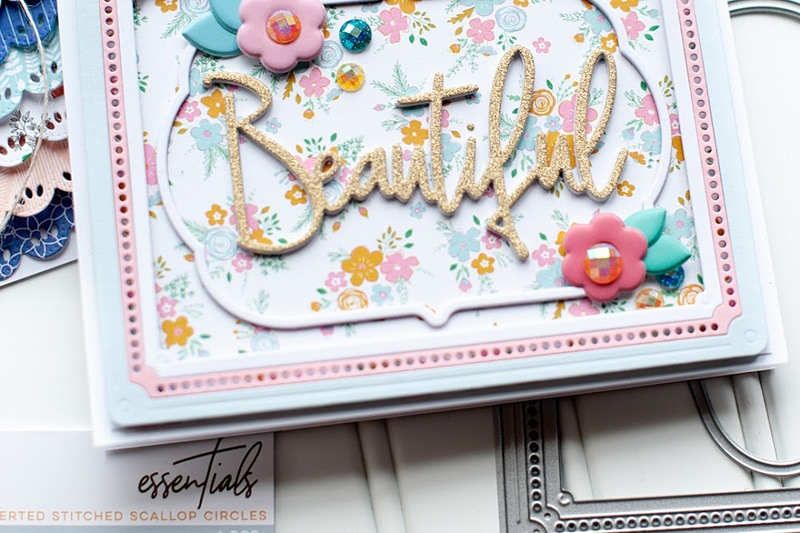 Before I share my card, I wanted to also share that Bazzill Basics has done a Lawn Fawn color match for the Bright Side paper and Bazzill Basics cardstock. This is such a great tool, and really makes sure that you get perfectly matched cardstock. We have the matching Bazzill cardstock, and let me tell you....it really does match perfectly. Bazzill definitely knows what they are doing! And as Lawn Fawn adds new collections to their arsenal, it will get updated on this color match page! So, with all that said...here is the card that I created for tonight! Instructions: Make card from smooth white cardstock. Cut a whirlpool cardstock block slightly smaller, round the upper corner and adhere to the front. Diecut the two grass layers from patterned paper, and adhere to the bottom of the card. Stamp the sentiment to the bottom of the card, and finish with a stamped heart. Diecut the rainbow layers from patterned paper, adhere to the right side of the card and trim off the excess. Diecut the heart from patterned paper, and adhere to the bottom of the rainbow. Stamp the cloud & heart to white cardstock, cut-out, adhere and color in the heart. Stamp the castle to patterned papers, cut-out, layer together and adhere. 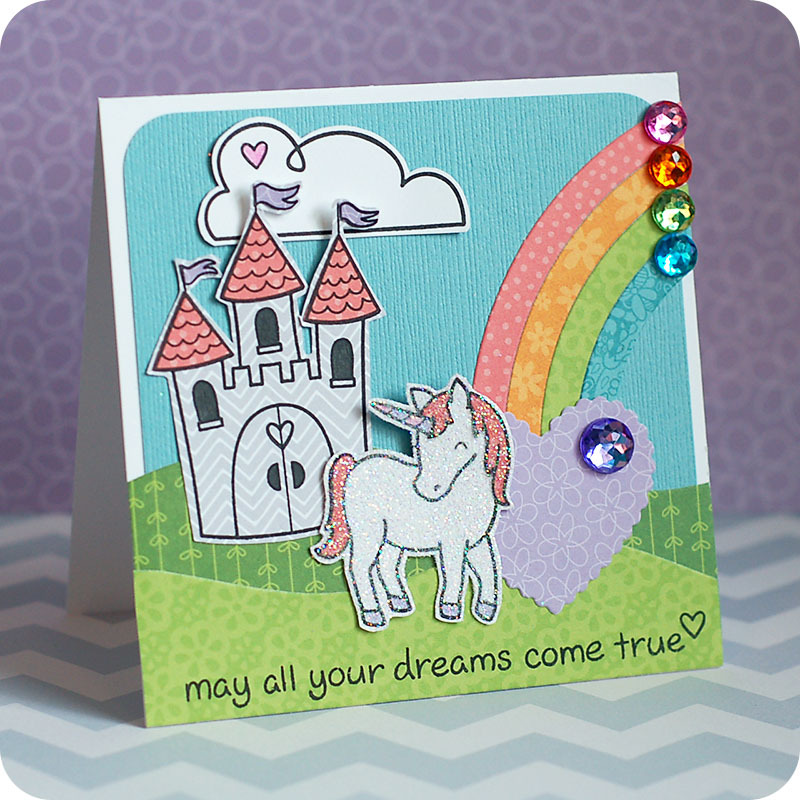 Stamp the unicorn to cardstock & patterned paper, cut-out and layer together. Color in the hooves & horn, cover in glitter and adhere to the card front. Color in the windows and door handles on the castle with a black pen, then stamp a heart on the doors. Add jewels to the rainbow to finish. I hope that you've enjoyed my card for "Critters Ever After"! Be sure to check out what the other designers have created as well! Beautiful little scene you have created. Such a cheerful creation. This is just so whimsical... Love that unicorn and the rainbow. Wow, I am thrilled with your rainbow! Love it so much and will be "borrowing" that idea in the future ;-) thanks for the inspiration! I love it! What's not to love? Total Lisa Frank memories! This is the first time I've seen your blog and I love the name! Looking forward to seeing more! Absolutely fun and... so... so... sooooooooooo.... cool, Lea! Wow, Lea, this is so cute! I love that you made the unicorn sparkly! Your scene definitely reminds me of Lisa Frank! Awwww your card is gorgeous!! I love everything on it, the rainbow the glitter and jewels, all the paper piecing! It's adorable! Beautiful. I love that you glittered the unicorn.